Tires: Front 16 x 2.5" and rear pneumatic 10 x 3.5"
Introducing GoPetTM, the 3 wheel scooters electric motor scooter designed for urban commuters tired of the high price of gas, parking fees and endless traffic. With the GoPet you whisk along at up to 16 mph, with a range of up to 25 miles per charge. The GoPet comes standard with a front and back light for safety, plus an optional roomy basket can hold essential items for your commute. When you reach your destination you can take your GoPet indoors with you, up elevators and even into an office. There’s little or no maintenance and with a charging time of 4-6 hours you are always ready to be on the move... on your GoPet. Introducing GoPetTM, the 3 wheel electric scooter designed to increase productivity and efficiency in hospitality, convention and resort applications. 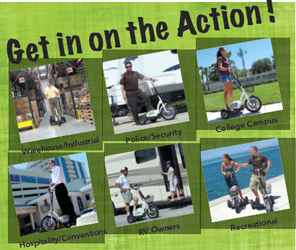 Food, housekeeping, maintenance and other personnel can quickly respond to customer requests on speedy GoPet scooters. Even the largest facilities are no match for GoPet with its top speed of 16 mph, a range of over 25 miles per charge and the ability to be used both indoors and outdoors. Plus, the GoPet’s quiet operation won’t disturb your guests. Get your facility in motion... with GoPet! Introducing GoPetTM, the electric motor scooter designed for increased productivity and efficiency in warehouses and industrial plants. Maintenance, order picking and security are just a few of the many applications where GoPet can make a difference. With its top speed of 16 mph, a range of over 25 miles per charge and the ability to be used both indoors and outdoors, the GoPet personal electric scooter is ready for action. GoPet features fatigue-fighting rubber foot pads, a wide standing platform for safety and stability plus pneumatic wheels for a smooth ride. Get your plant or warehouse moving... with GoPet! Introducing GoPetTM, the 3 wheel scooters electric motor scooter designed to be used by police and security personnel for fast, quiet response in emergencies, as well as day-long patrols and surveillance. With its top speed of 16 mph, a range of over 25 miles per charge and the ability to be used both indoors and outdoors, the GoPet is ready for duty. GoPet features fatigue-fighting rubber foot pads, a wide standing platform for safety and stability plus pneumatic wheels for a smooth ride. Get your security team in motion... with GoPet! 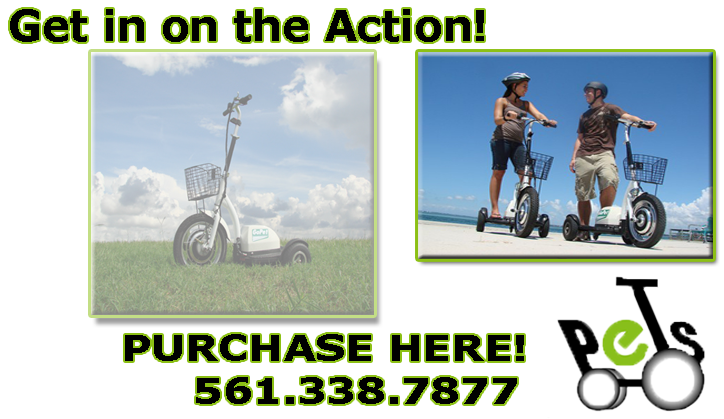 Get in on the fun with the new GoPetTM, electric motor scooter that gives you the freedom to explore parks, beaches or other interesting locations comfortably and safely. With the GoPet personal electric scooter you whisk along at up to 16 mph, with a range of up to 25 miles per charge. The GoPet comes standard with front and back lights for safety, plus an optional roomy basket to hold essential items for your ride. The GoPet’s stable three wheel design is easy to ride for shopping or errands too. Get your life in motion... with GoPet!